This year, the Millennium Development Goals (MDGs) come to an end, and all the world’s governments will agree on a Post-2015 Development Agenda and set of 17 Sustainable Development Goals (SDGs) – as described by Kevin Watkins in his article in this issue of Alliance. Influencing how the SDGs are implemented is enormously important because they will drive the bulk of official development assistance, and the work of development ministries and government departments around the world. Moreover, they are universal: all governments will be expected to adopt them and to report on their achievement. 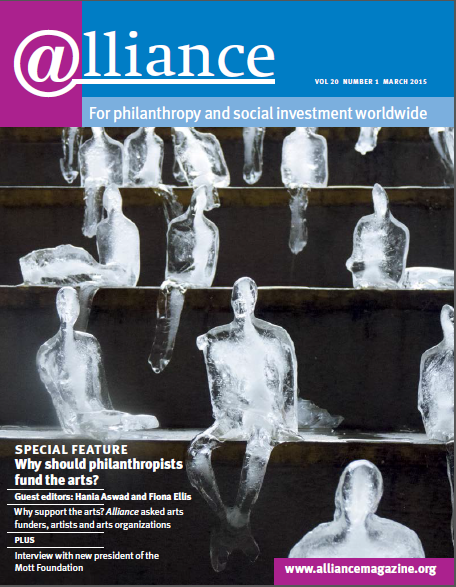 How is the philanthropy sector responding? Foundations and individual givers largely select their causes on the basis of the passions and interests of their founders, boards and leadership teams, or from compelling non-profits with whom they interact. Less common is programme design that consciously builds on global or national development targets and government and UN commitments. There are exceptions in specific fields like HIV/AIDS and women’s rights, but in general the meta-level frameworks have never represented or captured the attention of philanthropy as a whole. The strategy is both to encourage UN and government representatives to take part in philanthropy events and to enable philanthropy representatives to join and influence UN and government meetings. At the country level, the Platform provides a means for philanthropy to facilitate partnerships and help translate the global narrative into local priorities. The strategy is being piloted in Kenya, Colombia, Indonesia and Ghana. The assumption is that if active collaborations can create deeper and more effective development interventions, they will become the new norm in an increasing number of countries. A meeting held at the Ford Foundation in New York in September 2014, attended by 150 representatives of government, the UN, foundations and civil society networks, confirmed the interest of foundations that are already aware of UN processes. But the real proof of concept for the Platform was the level of interest at country and regional level. Would philanthropy actors be excited by the opportunity of engaging, or dissuaded by the obvious challenges? The Brazilian government is a leader and takes firm positions in the Post-2015 Agenda negotiations – could Brazil’s philanthropy sector also become a leader in this, in Brazil and in Latin America? At the Philanthropy in Asia Summit in Singapore in October 2014, a plenary session on the Post-2015 Agenda was well received in a regional setting where public-private cooperation is taken for granted. Participants were urged not to let local values, culture and solutions get lost in the SDG planning process. The need to use business as a pressure point to achieve the SDGs was emphasized, and the importance of finding the right measures of progress. There is a need to measure quality over quantity (for example in health and education), and to find measures of well-being, happiness and community. It was acknowledged that development is a fragmented process in Asia – hence the importance of creating a system where all sectors can contribute. The philanthropy sector has often focused on education, health and the needs of local communities. For many participants, therefore, thinking about how to make their giving contribute to achievement of the SDGs in their home countries or elsewhere is new. While there was a willingness to be more transparent, new methods of reporting – like contributing to the Platform’s SDGfunders.org website – was seen as a departure from business as usual. Encouragingly, more than one philanthropy institution from Singapore, and the China Foundation Center, expressed interest in their countries becoming pilots in this project. The next opportunity to roll out the concept was at November’s Brazil Philanthropy Forum, an annual meeting bringing together about 100 participants – a mix of corporate and family foundations and philanthropists. Brazil is a country that would be well positioned to build collaborative platforms for the Post-2015 Agenda: it has an active and growing philanthropy community, an engaged business sector, and robust networks like GIFE and IDIS, the Forum organizer. At a session on the Post-2015 Agenda, UNDP’s lead on foundations, Marcos Neto, himself a Brazilian, posed this challenge: the Brazilian government is a leader and takes firm positions in the Post-2015 Agenda negotiations – could Brazil’s philanthropy sector also become a leader in this, in Brazil and in Latin America? Many, like Cloves Otavio Nunes de Carvalho, CEO of the Votorantim Institute, anticipated engaging with the emergent framework of successor goals but saw it as too early to commit to which of the 17 SDGs might be chosen as local development priorities. The 17 SDGs have greater breadth than the eight MDGs and provide far more entry points, but foundations will need to select their priorities, as will other civil society actors and the business sector. Kenya is the first of several pilot countries, and its Platform launch drew 80 participants for a day-long workshop in November 2014. Leaders came from the philanthropic sector, the UN system, civil society, business and government to discuss the national themes relevant to the Post-2015 Agenda. For Kenya, these were financial inclusion and youth employment, education, and women’s rights and empowerment. One challenge for the philanthropic sector in Kenya, as elsewhere, is shifting from individual projects to collaborative efforts. Other relevant considerations were recent changes devolving authority from central government to the county level, and proposed amendments to the Public Benefit Organizations Act. Some stressed that although the presence of international philanthropy is important, local, indigenous foundations are key in sustaining progress in the long term. The Partnership Platform’s data element, SDGfunders.org, was embraced enthusiastically by participants, since a major challenge in building effective collaboration is a lack of willingness to share information and of mechanisms for doing so. Nicanor Sabula of the East Africa Association of Grantmakers noted the need for ‘a central repository for data and statistics which can be presented to government and other stakeholders, putting us in a much better place to negotiate and accurately present the valuable contribution of this sector in development’. It remains to be determined whether the National Bureau of Statistics, as a government actor, would be the right institution to compile information provided by ‘non-state actors’ such as foundations, or whether an independent platform would be better. These country and regional discussions brought to the surface various issues and challenges and some ideas about how they could be addressed. More opportunities for systematic exchange on lessons learned should improve impact – though finding the time is a challenge for already overworked foundation staff. More aligned reporting as a community, rather than each foundation defining its own programme areas and priorities, would benefit all foundations by saving staff time, avoiding duplication and helping to find co-funders. Designing platforms that take into account national and thematic contexts could help to balance transparency of information with the sensitivity of some grantmaking. Finding more nimble ‘partners’ (departments, individuals) within bureaucratic organizations like the UN could help collaboration with philanthropists and enable better use of the data held by such bureaucracies. Challenges remain in getting independent-minded philanthropic actors to collaborate, not only with the UN system and governments but with each other. As a few of us observed last year, the hard work of compromising through what is known as ‘diffuse collaboration’ requires short-term efforts for medium- and long-term gains. Some governments, even as they move towards more accountability for their decision-making and implementation, remain suspicious of philanthropy and its support of other civil society actors who may themselves be critical of those same governments. But these are tractable challenges that an increasing proportion of the philanthropy sector is willing to address.